Investor’s Business Daily wrote about it: $2 billion of institutional funds is blowing-up the east end of DTLA. The boom includes “curated” retail (as depicted in ABC7's Eye on L.A. It’s led by the Michael Maltzan-designed One Santa Fe development. Suddenly the Arts District is L.A.’s art and architecture center: Hennessey & Ingalls bookstore moves here from Santa Monica early next year. The A+D Museum opened shop in July. Soon: Hauser, Wirth & Schimmel museum. And then, the new, uber-hip Soho House. Oh, did we mention One Santa Fe took top honors on AIA-LA’s Design Awards? It’s a Moderne masterpiece designed by William Lescaze, replete with sculptural curves, Deco portholes, and irreplaceably classic elevator cabs and handrails. The six-floor, 100,000-square-foot space is drenched in entertainment legend. It includes the former Columbia Square Playhouse, where Lucille Ball invented the two-camera shoot. Former recording studios favored by Brian Wilson are now private meeting rooms. If there is such a thing as creative karma in a building, it would be here. For the full (short) story, click here. Sea Summit at Marblehead unveiled its 100-acre nature preserve and hiking trails. ABC7 TV unveiled its drone camera. It was a match made on land and sea and sky. Sea Summit at Marblehead in San Clemente is not only building a famously delayed coastal community, it is preserving and restoring over 100 acres of precious natural habitat. This includes a new wetlands preserve which provides a home for endangered waterfowl and helps divert and cleanse groundwater runoff during California drought conditions. The Center for Natural Lands Management meticulously oversees the preserve. JSPR invited select media to join with The Center for Natural Lands Management and developer Taylor Morrison in a tour of the emerging community and nature preserve. And ABC7 News returned to shoot extensive drone coverage of the area. ABC 7 TV recently visited the Arts District of Downtown Los Angeles. The growing neighborhood's most significant new landmark is One Santa Fe, the new community designed by Michael Maltzan Architecture. It's not only the longest building in L.A., it offers new homes for artists and an alternative transportation program with a fleet of 50 bikes. 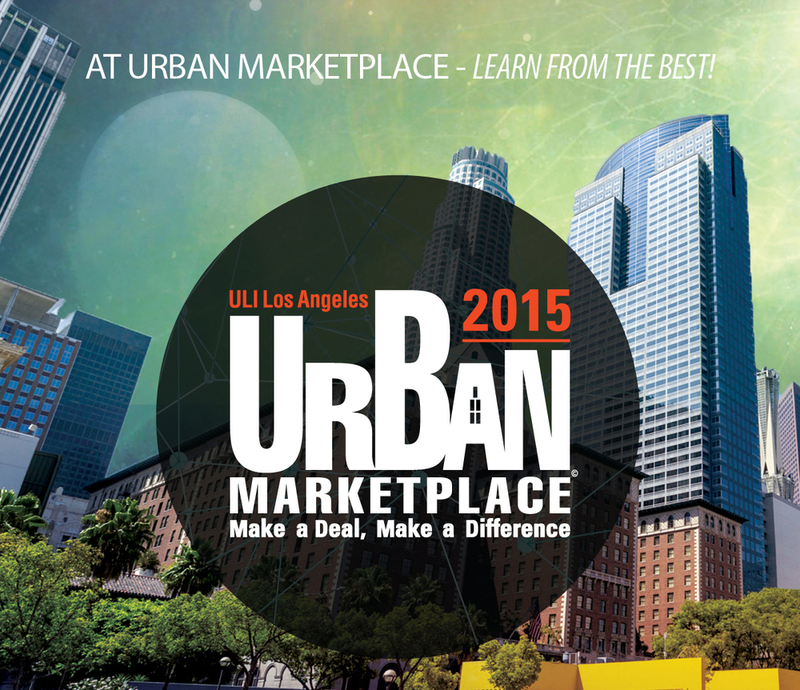 ULI Los Angeles' Urban Marketplace makes excitement again Thursday, April 2 in DTLA. Please, don't call it a "real estate conference!" Urban Marketplace is the interactive happening where high-level overviews of the development scene balance with grass-roots responses by people making deals and making a difference. These occur at Urban Marketplace’s famous roundtable sessions: face-to-face conversations on L.A.’s hottest issues. Among the topics this year: Reinvestment and Placemaking Along the L.A. River; the Bioscience Corridor; Sustainable Urban Farming; Solving the First-Mile/Last Mile Transportation Conundrum; Federal Resources for Local Challenges; California’s Cap and Trade Engine for Growth; and several more. The keynote speakers, however, refuse to be overshadowed. They are urban developers and finance experts, including Tom Gilmore of Gilmore Associates, and Michael Banner of Los Angeles LDC. The setting this year is at The Reef, the unusual new event and office space at 1933 S Broadway Ave. Register online at ULI Los Angeles. It has taken four decades for Sea Summit at Marblehead to get going. During that time, this precious coastal property underwent rigorous approvals and seemingly endless community input (and lots of opposition!) The recession also slowed things down: The previous developer, SunCal, was backed by Lehman Brothers, one of the mega banks not to survive the financial meltdown. But like a gem compressed over time, the final result is stunning. New developer Taylor Morrison Homes has begun integrating resort-style residences behind a nature preserve of canyon and bluff habitat. These more than 100 acres -- including 4 miles of hiking trails -- are overseen by the Center for Natural Lands Management. And the project enjoys widespread support. Recent media attention has included an A-1 cover story in the Los Angeles Times and ABC7's Eyewitness News. 2014 saw Downtown Anaheim explosively revive its urban fabric. In the spring, Brookfield Residential welcomed its first move-ins to The Domain, a community of 100 stacked flats and townhomes. On May 31, The Packing House, developed and curated by LAB Holding, Inc., opened as California’s most popular new food hall and as the nucleus of the restaurant-oriented Packing District. Most recently, an eight-story, class-A building leased its entire 191,556 square feet to St. Joseph Heritage Healthcare -- Orange County’s largest office lease of the year. The City also launched a branding campaign to propel it success. last week, JSPR worked with these players and Urban Land Institute Orange County/Inland Empire to produce "Exit Suburbia: Inside the Anaheim Packing District" case study and site tour -- the most delicious site tour ever, since it included all the Packing House vendors. JSPR President Jack Skelley organized and moderated the panel. Bringing in LAB Holding allowed that to happen. Sadeghi and his team developed the Packing House from what it was into what it is today. That is what they are getting at the Packing House, which offers authentic cuisines including Indian, sushi, ramen and Vietnamese and French crepes as well as gourmet grilled cheese crafted by local artisans and food merchants. The two-story building, once an actual packing house for Sunkist citrus fruit, also sells non-edible goods and gift items, and visitors are likely to see items as unlikely as a tractor and a linens cart within feet of each other. Across the street from the Packing House is the Domain, a collection of 100 stacked flats and townhomes ranging from 800 square feet to 1,600 square feet. O’Brien explained that the homes, developed and owned by Brookfield Residential, are centrally located in the District and offer residents services and amenities that include a rooftop retreat and technology prewiring. In addition, they’re within walking distance of all the Packing District has to offer, including the Packing House, Anaheim Brewery, Umami Burger and a host of other community amenities. Sadeghi said the Packing House offers “multi levels of satisfaction and experience. You can’t just be a retailer or a restaurant—it’s boring.” Basically, it takes a page from the current trend of experiential retailing that has breathed new life into the sector. Whether they’re locals or Disneyland visitors from other parts of the country, this area is beginning to offer both options and a depth of experience usually seen in larger, more established cities. Jack Skelley and JSPR thank colleagues, clients and cohorts for another inspiring year. May 2015 be even more awesome! This super-speed video grabs just some of the highlights of the year. While about half of the HelterSkelley / JSPR Instagram posts are related to Urbanology, another large share reflect our obsession with music. This speedy Filpagram video -- 15 seconds! -- recaps just a few of those events and experiences from 2014. They include concerts from Tame Impala and Paul McCartney to the Punk Rock BBQs at Liquid Kitty where Jack Skelley's band Lawndale is the house band! Plus some of the songs on heavy rotation on HelterSkelley's Soundcloud and ipod. Video music is Andrew Weatherall remix of "Soon" by My Bloody Valentine. ULI Los Angeles also hosts a site tour of Runway at Playa Vista, November 20. The retail/office/residence experience opening early next year includes a Whole Foods market and Cinemark theaters. Among the presenters at the case study event will be Alison Banks, Director of Marketing, Brookfield Residential. She will contextualize Runway within the dramatic scope of Playa Vista. One of the largest construction projects in California, Playa Vista is building 2,800 residential units – yes, 2,800 — for West L.A., including for the many Silicon Beach, creative-space workers currently commuting from other parts of the city. At a recent groundbreaking, Cuningham Group Architecture released design details of All Net Resort and Arena on the Las Vegas Strip. Main components include: an NBA multi-purpose arena with retractable roof (the only such arena in the world! ); a grand pedestrian plaza; and 44-story, five-star hotel with 500 specialty suites. All Net Arena will have one of the most striking appearances in the world of entertainment. The spherical exterior is inspired by the barrel cactus found in Red Rock Canyon. This profile is animated with brilliant light and color, as the arena is sheathed in a matrix of LED screens, creating an immersive, interactive environment. Cool, right? The $1.4 billion development broke ground Oct 29 to nationwide media coverage such as Associated Press and U.S. News and World Report. Ehrlich Architects Reinvent the Work Environment: A recent site tour by Urban Land Institute unveiled new office-space solutions. ULI Los Angeles’ case study was held at the under-construction elevon at Campus el Segundo. Attending were community leaders, top brokers and design professionals. elevon allows businesses to purchase their office building – unique in the L.A. area. The design also sets it apart: “There is a feeling of being in your own house, including private outdoor areas,” said Architect Steven Ehrlich of Ehrlich Architects, famous for custom homes around the world. “And they are set within an overall neighborhood context.” Natural light and natural materials are everywhere. Ehrlich’s residential-inspired elevon design has been profiled from Globe Street and L.A. Business Journal to Form magazine. Above is a photo from the ULI event and below an interior rendering. Here is a report from the ULI tour. Los Angeles Times photographer Christina House photo of Jack Skelley and Shaheen Sadeghi at the future home of Make in Downtown Anaheim. Life in the Food Lane: Along with his clients, JSPR President Jack Skelley recently made the cover of Business. LA Times reporter Andrew Khouri examined the revitalization of Downtown Anaheim – including its popular Packing House food hall, a wine- and beer-making development, new condos The Domain by Brookfield Residential, a central park for farmers markets and events, and artisanal shops along Center Street curated by retail wizards LAB Holding. The area is getting attention from urban-planning and food geeks alike. It is one of several nationwide “foodie districts” where gourmet (or just hungry) residents are revitalizing downtowns. Photo below is from Wall Street Journal reporter Katie McLaughlin’s story on same. UCLA’s Alarming Rent Report: When it comes to rent, Los Angeles is the most unaffordable market in the country – worse than even San Francisco and New York. This dire situation has been growing for decades, as affordable housing dwindled and wages stagnated. UCLA Luskin School of Public Affairs and UCLA Ziman Center for Real Estate published a paper summarizing the data on this crisis. The news has been covered in Los Angeles Business Journal, Curbed LA, KPCC, and major financial media. Creative Cooperation: There is a natural synergy between good PR and good branding. However, many marketing firms are missing in-house PR. JSPR is filling the gap. Since launching just over a year ago, JSPR has collaborated with SoCal’s best marketing teams in the realm of placemaking. These alliances are propelling high-profile developments in the region: With HEXA (L.A.’s top Asian media agency), JSPR helped make The Ritz-Carlton Residences at L.A. LIVE the best-selling highrise in Southern California. InterCommunicationsInc and JSPR are highlighting the innovative Elevon office masterplan in El Segundo. With Greenhaus and Sandra Kulli, JSPR is establishing a strong identity for the revitalization of downtown Anaheim. And with Gunn Jerkens we are building a whole new level of buzz for Playa Vista. Other collaborators are Urbana and Looking. Elevon: Be honest. Are you excited about going to work? Maybe more people would be if their offices were – you know – exciting. That’s the concept underlying Elevon at Campus El Segundo: SoCal’s only new work environment allowing businesses to own their space. (A huge financial advantage, at today’s interest rates.). The innovative design is by Steven Ehrlich, the renowned residential architect. It translates how people love to live to how they want to work. The for-sale spaces of Elevon are moving quickly. Transit-Oriented L.A.: JSPR continues its affiliation with Urban Land Institute Los Angeles and its ToLA events – Transit-Oriented Los Angeles. Last year ToLA made news when Mayor Eric Garcetti announced his Great Streets initiative: transforming city boulevards through creativity and economic power. Here is a video from the event. ToLA will host world-famous names in transportation design, November 12, at Japanese American National Museum in Downtown L.A. The event is themed: The Art of Go: Active Transportation for Healthy Cities. Here is a quick preview. Huffington Post: In New York, biking is a contact sport. That’s the takeaway from a recent NYC visit comparing bike infrastructure in Manhattan and L.A. Both cities are lacking and that’s dangerous for all of us. You can read my monthly HuffPo column here. The Perils of Biking in Manhattan... and L.A.
Biking in Manhattan is a contact sport. It includes confronting cabbies and dodging pedestrians (who in welcome ways have a supremacy of the street). It demands nano-second reflexes, a sense of daring, and nerves stronger than your bike frame. For adrenaline junkies and thrill seekers, I’d guess it rightfully vies with bull riding or wind surfing. Let’s put it this way: I would not allow my 16-year-old daughter to dare the streets of Manhattan on two wheels. I learned from my recent visit – riding from Midtown to the north end of Central Park – that bikes are still on the low, desperate end of Manhattan’s transportation food-chain. Allegedly, bikes have jurisdiction in bus lanes. But all other vehicles shoot through these lanes as well, eliminating any advantage. And these lanes are sure to be blocked by double-parked trucks and eternal street construction. Only in bike lanes that are physically separated from rest of traffic can one travel safely. The problem is, in Midtown such lanes are rare. There is one on the far East Side (First Avenue), but it only travels north. Another separated lane on the West Side is wide and beautifully landscaped, along the West Side Highway, with views of the Hudson River. So, enjoy the freedom of these routes if they are going where you are. But just try to jag over to Central Park, for example, and it’s back to bare-knuckled confrontations. It’s worth getting to Central Park, however. That’s where you’ll find the best ride of all. The hundreds of pedestrian paths are off-limits for cyclists, but a six-mile bike loop near its perimeter is carless. It takes you all the way to north edge of Central Park, then back down again, with exhilarating hills, dips and endless diversions. There are also certain throughways for runners, walkers, bikes and limited cars. Here is where you’ll hear runners and riders get verbal revenge on the cabbies that otherwise rule the city. “This is my lane, not yours!” they bark at drivers obliviously drifting into their lane. The same lack of bike infrastructure that plagues New York is increasingly alarming in L.A. It seems that almost every Angeleno knows of a bike rider who has been injured (or killed) by a car. In fact, Chris Walker at L.A. Weekly recently wrote that Los Angeles is the most dangerous city in the world for bikes. He points to statistics showing an average of two bicyclists per month are killed in traffic. A figure that multiplies as more cyclists hit the road… and more cars hit them. Some positive news: Bike advocates the Pasadena Complete Streets Coalition seems to have gotten the ear of Pasadena planners to create a set of east-west protected lanes. And the much-discussed My Figueroa plan will include cycle-ways. As usual, Long Beach leads the way in bike progress, with 40 miles of Class I routes (bike paths dedicated to bike and pedestrian traffic). But setbacks continue too. In a move the riled bike advocates, L.A. City Councilman Gil Cedillo recently cancelled long-planned bike infrastructure through North Figueroa Street. Cedillo claimed his veto was to improve safety, but his rationale defies reason. It’s an area that Los Angeles Times research showed is one of the most dangerous in the city. Over a 10-year period, David Zahniser and Armand Emamdhomeh report, the street had 68 car-vs-bicycle collisions, and 153 car-vs-pedestrian collisions. Nine of these resulted in death. More, not less, bikeways are needed for safer streets. One Santa Fe: JSPR is now repping the iconic One Santa Fe. Designed by starchitect Michael Maltzan, this new Arts District landmark is L.A.'s longest building (nearly 1/3 of a mile! ), with 438 view residences. Its cool retail (The Yards) is from Runyon Group – the city's most adventurous retail team. One Santa Fe is an architectural mind-blower. Pure horizontality and odd angles render dozens of unique floorplates and views. OSF brings the long-blossoming Arts District to full flower. Just around the corner, former MOCA curator Paul Schimmel and international gallery powerhouse Hauser & Wirth will open a seven-building arts compound. One Santa Fe’s first phase opens in September. Anaheim: If you think Anaheim is just Disney, the Ducks, The Angels and Convention Center (that’s not enough? ), then visit The Packing District. It's where LAB Holding and the City of Anaheim created The Packing House. The beautifully restored, historic Packing House is packed with indie eateries. It’s a scene! SoCal’s answer to SF’s Ferry Building. The surrounding Packing District includes Farmer’s Park (with entertainment and farmers market) and urban dwelling at The Domain. Created by Brookfield Residential – and joining 1,500 new homes in downtown Anaheim – this is the residential centerpiece of The Packing District, and a true foodie mecca. Here is ABC7’s coverage. Huffington Post: Look for my monthly reports on design in the public realm. A recent visit to New York City inspired an upcoming post comparing bike infrastructure in Manhattan and L.A. Both cities are dangerously lacking! Most recent column is about how major cities are suffering the worst from – and doing the most about – devastating climate change. The Farm Campus: It was a blast working with writer Jessica Blotter andCuningham Group Architecture on this Fast Company article. The healthcare software campus is as green and innovative as any Google or Apple HQ, but it’s in the heart of rural Wisconsin and astonishingly disguised as a huge dairy farm! A piece of Pete Townshend's guitar is between the Union Jack and the Led Zeppelin logo. 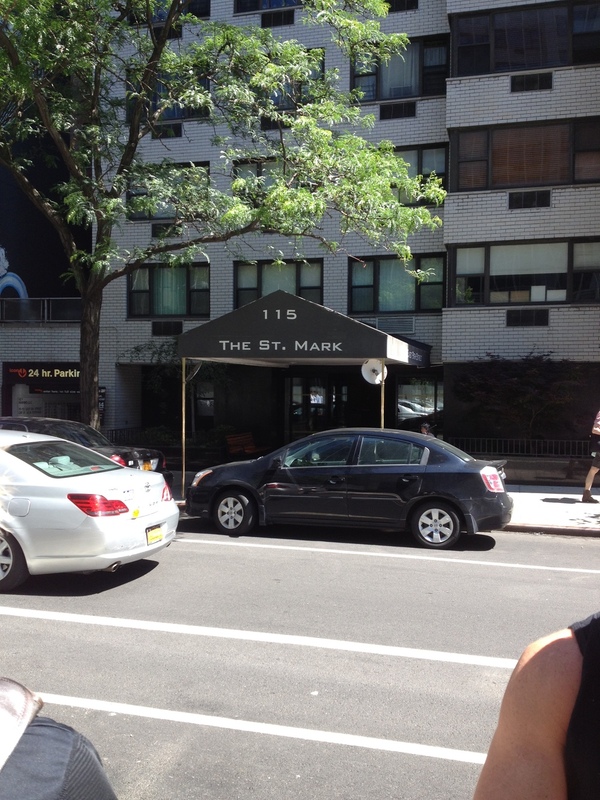 Musicologist Bobby Pinn provides the ultimate walking tours of New York’s East Village for rockoholics. Here are some of the highlights. Bill Graham’s Fillmore East – the Second Avenue venue that witnessed legendary performances by The Allman Brothers Band, Frank Zappa and the Mothers of Invention (with John Lennon sitting in), the first performance of the Who’s Tommy and much more – is now a bank. It closed in 1971 after numerous underage drinking citations. The remaining evidence is a street sign designating this block Bill Graham Way, and an incredible street-post mosaic. Artist Mosaic Man (who has hand-decorated several posts in the neighborhood) created a tribute to those who performed here. It includes a piece of Pete Townshend’s smashed guitar. What was once rock club mecca CBGB is now this trendy boutique with $2,000 jackets for the new denizens of the East Village. The boutique (named for rock photographer John Varvatos) prudently preserved many of the walls: Every square inch is gloriously covered in graffiti and band stickers. Some of the walls are behind plexi-glass, but others are just bare. Somewhere in here was a sticker for my band Lawndale who played here in 1987. My son, Paul, a Ramones lover who has his own band The Rock Mummies, wrote his name on the wall before he was asked to leave by the store owners! New York City Original Rock 'n' Roll Walking Tour is a blast! … makes driving miserable, but walking great. The pre-automobile layout of the Back Bay and North End resembles European cities. Narrow streets and alleys – many of them part of the Freedom Trail walking tour – curve and meander to reveal hidden piazzas and tiny but stately squares. The merchants of Boston clearly benefit from this car-unfriendly design. The North End’s Salem Street teems with dozens of small Italian restaurants, each more alluring than the last, and each full of customers. It has long been mythologized that Boston’s original street grid evolved from cow paths winding through original forests and hills. Whether true or not, it’s great that the city never straightened it in some misguided fit of urban renewal. It’s part of what gives the city its great charm. Great for bike riding too. Can Cars and Bikes Just Get Along? Los Angeles is going through an awkward stage. Long famous for its car culture, it now has a sizable biking/walking populace that is only getting larger. Drivers are used to ruling the road. Non-drivers are claiming their share of public space. Clashes between them – dangerous clashes – are growing. This conflict came into sharp relief at the most recent CycLAvia event: You know, the scheduled festivals that close streets to cars. These celebrations are carefree because they are car-free. They allow people to rediscover and reclaim neighborhoods in ways that can’t happen when it’s traffic-as-usual. But they expose a problem. Streetsblog Los Angeles reporter Sahra Sulaiman described the moment at the close of CycLAvia when the traffic barriers were removed from Wilshire Boulevard and cars were suddenly sharing space with hundreds of bikers. Traffic officers ordered bikes to the right side of the road. But there was simply not room for so many bikes and cars. This forced scared or novice bikers (including children) up onto the sidewalks with pedestrians. Which is no solution either. Those options are protected bike lanes. And more are coming. But until we get protected bike lanes on every major street – probably not in this lifetime – cars and bikes need to co-exist in the same space. One solution is the three-foot law, recently signed by Governor Jerry Brown. Starting on September 16, of this year, California drivers must keep their cars at least three feet away from bikes they pass on the street. The law is bound to increase the friction between bikes and cars. Drivers are used to demanding full use of lanes. Some of them will aggressively resist the law. Some experienced bikers already claim that space. It’s not going to be pretty. So here’s another solution: Drivers can slow down and become more patient. I realize this is a non-scientific demand. It requires a psychological change, not a legal one. Today, when driving through a stretch of Overland Avenue, I saw a sign: “Drive Like Your Kids Live Here.” That is exactly right. As drivers, too many of us feel compelled to get “there” as fast as possible. We squeak through the left-turn arrow. We adroitly shift lanes to get ahead. We dare the speed limit (when we can). This is a natural reaction to driving in a city with terrible congestion. To “fight” the traffic we face every day is maddening. It can make the meekest person irrationally eager to “beat” the other guy and get ahead. But if it’s your kids playing on the sidewalks, or you are biking in the right-hand lane, you have a different attitude. You want drivers to chill. They can be a few minutes – or seconds – late. A beloved teacher of my daughter was riding her bike through an alley near school. A driver was cleverly taking this shortcut. There was a collision and hospitalization. That’s the problem we need to solve. I realize there’s another side to this story: The driver’s side. Neighborhoods that have adopted lane restrictions, speed humps, etc. can make congestion “worse.” And that makes drivers even more frustrated. When you’re stuck in traffic, it’s hard to get on the “traffic-calming” bandwagon. But there is a trade-off, as explained by Michael Bohn, design director at Studio One Eleven which has created “complete streets” re-designs across Southern California. Maybe, one day, we’ll live in a frictionless city. Like the futuristic L.A. of that Joachin Phoenix movie, Her, where everyone takes smooth, quiet public transportation. But until we change our city that dramatically, we need to change our attitude. SoCal foodies and retail-istas know The Lab and The Camp. These imaginatively successful anti-malls have taken root in a once-forgotten Costa Mesa triangle. Their shops and restaurants are more genuinely indie and artisanal than in any other development in O.C…. or in L.A.
Now LAB Holding, the brains behind The Lab and The Camp, are back with more amazement, this time in downtown Anaheim. Opening May 31 is The Packing House. This 42,000-square-foot, 1918 Sunkist warehouse has been transformed into a gourmet food hall: a huge, sun-drenched atrium with communal dining surrounded by cafes as well as picnic gardens, orange trees, outdoor fireplace and a building-length dining porch. The Packing House’s public spaces are designed for community events, concerts and movie screenings. Given LAB Holding’s retail track record and this amazing space, The Packing House may soon rival San Francisco’s Ferry Building, developed by Wilson Meany, a respected magnet for locals and visitors. The coolness doesn’t stop there. The Packing House is just one component of the new Anaheim Packing District. At the intersection of Anaheim Blvd and Santa Ana Street, The Packing District includes new Farmer’s Park, more historic structures converted into restaurants (including Umami Burger) and Anaheim’s new residences, The Domain. The Domain is the residential centerpiece of The Packing District. It pays stylish respect to the classic architecture around it, with lofts, flats, pool deck and rooftop terrace overlooking the Packing House. The Domain just opened its doors and builder Brookfield Residential has nearly sold out the first phase. One happy new owner is photographer Staci Hart who blogged about The Domain's opening here. Chris Bennett, director of development for LAB Holdings, repaid the compliment last week when interviewed by the Orange County Register. “I think [The Packing House] is just an extension of the lifestyle that this is [The Domain’s] backyard,” Bennett said.